I belong to the Missionary Society of Heralds of Good News, India. I entered the minor seminary of the Order in 1993 and was ordained a priest in 2001. I have a Master’s Degree in Christian Studies and Bachelor of Education from Madras University. I served the Order as an administrator and visiting professor of theology and philosophy in the major seminaries and rector of minor seminary. I also served as General Secretary, Treasurer General and Superior General of the Order for six years. I worked in Divine Mercy School for 15 months as Correspondent. Now I am here in Western Grays Harbor as Priest Administrator. I love being a priest. My priestly motto is "Set apart for the Gospel." I like reading, meditation, personal prayer and preaching. I am also interested in teaching, youth ministry, and retreats. I'm interested in assisting those wanting to return back to the Catholic faith. I love praying the Divine Mercy chaplet and reciting the holy rosary daily. Fr. Vinner Raj Simeon Raj, H.G.N. Fr. Vinner was born in 1984 in India. It was his desire and his grand parents’ prayers that led to his ordination to the priesthood in the year 2012. 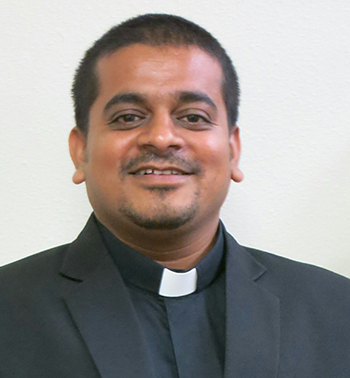 During his four years of priesthood he has been given various responsibilities, serving as a parochial vicar for two years in the Archdiocese of Bangalore, and then two years in the school ministry. Fr. Vinner is interested in reading spiritual books, and is passionate in his devotion to our Blessed Mother Mary and reciting the Holy Rosary. He is especially dedicated to daily personal prayer, and would like to encourage the faithful to become closer to the Lord by praying as a family every day at home. My grace is sufficient for you (2 Cor 12:9). Fr. Victor Raj Anas Dass, H.G.N. I am Fr. Victor Raj from Tamil Nadu. I was ordained on May 8, 2013 to the Missionary Society of Heralds of Good News, India. 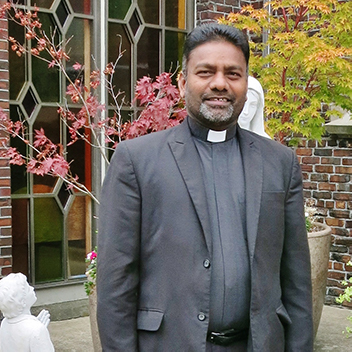 As a new priest with lots of enthusiasm, I was voluntarily accepted to go to the Mission state of Meghalaya and worked among the tribe of Garos. After my mission experience, I was appointed as vice Rector in spiritual orientation, Andhra Pradesh. Later, I had an opportunity to render my Ministry at St. Mary’s basilica, Bangalore in Karnataka. Later, I was sent to serve in the Archdiocese of Seattle and I arrived here on June 12, 2017 to continue my priestly ministry. As I dedicate my life for the service of God, I am ready to take up any responsibility to spread the Gospel values to every nook and corner of the world. I believe that Mother Mary is accompanying me on my ministerial journey as she accompanied the ministry of Jesus. Praise be to God forever. Fr. 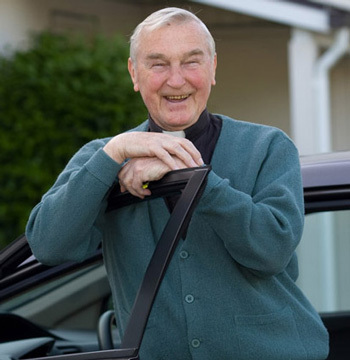 Steve lives and ministers at St. Jerome Parish in Ocean Shores, but just about every weekday he travels the 40-mile roundtrip to Aberdeen. Depending on the day, he may visit the sick, say Mass at an assisted living residence, spend time with students at St. Mary School, chat with volunteers at a free lunch program or stop by the regional office to do paperwork. 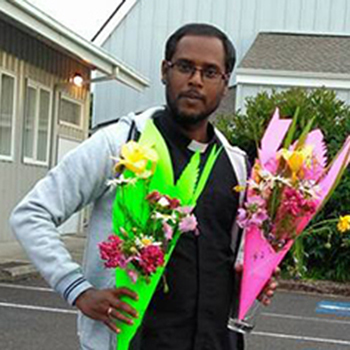 His weekend schedule can include Masses in Amanda Park, Ocean Shores, Westport and Hoquiam. Like other senior priests in the archdiocese, Fr. Steve is committed to helping out where he can, continuing his life of ministry to make sure Catholics throughout Western Washington can attend Mass and receive the sacraments as the number of priests declines. "I did retire, but I'm working harder now than if I had not retired," Fr. Steve said. "If you’re a priest, you just die in the saddle. That's my attitude," he said. "I'm happy and working hard."